Russian Emergency Ministry employees among the wreckage of a crashed plane at the Rostov-on-Don airport, about 950 kilometers (600 miles) south of Moscow. The FlyDubai Boeing 737-800, en route from Dubai, crashed as it attempted to land in Rostov-on-Don early on March 19, killing all 62 on board. According to Russian experts, investigators are working on several theories for the crash – from a terrorist attack to pilot error. Russian investigators are looking into several possible causes of the country’s latest air disaster, after a FlyDubai airliner crashed while attempting to land in poor visibility at the airport in the southern Russian city of Rostov-on-Don in the early hours of March 19. The Boeing 737-800, en route from Dubai, crashed about 250 meters short of the runway while attempting a landing. All 55 passengers and seven crew members were killed in the disaster. According to the website Flightradar24.com, after abandoning its first attempt to land, the plane circled for two hours in the sky above the airfield before the captain decided to land for the second time. However, the plane failed to execute a landing and hit the ground as it attempted to climb, resulting in the aircraft breaking up. Russian experts say one of the main theories is a technical malfunction. According to Alexei Gavrilenko, captain of a Boeing 777 aircraft, “it is impossible to give a precise assessment” of why the captain opted not to land at another airport until the flight recorders are decoded. "The plane had been circling over the airport of Rostov-on-Don for two hours before a landing attempt, so it is likely that a technical failure could have prevented it from diverting to an alternate aerodrome," he told RBTH. The media reports do not mention any malfunction before the plane’s departure from Dubai, but experts agree that a failure could have occurred during the flight. 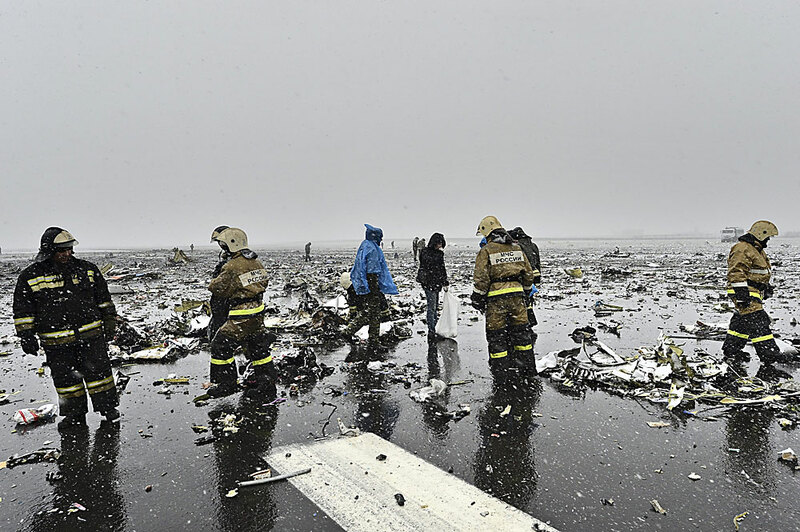 As Oleg Panteleyev, executive director of the Aviaport agency, noted in an interview with RBTH, ground control warned the Boeing 737 crew of bad weather in Rostov-on-Don before departure, and, if necessary, is always ready to provide an additional weather report at the time of landing. "The city was under a storm warning, wind with gusts up to 28 meters per second was expected," said Panteleyev. "The captain decided to land and it all depends on his decision. He is guided by the technical capabilities of the aircraft to operate in a variety of weather conditions, as well as by international air travel rules and FlyDubai's internal regulations. It is likely that he overestimated the capabilities of his aircraft." According to Boeing-777 captain Gavrilenko, pilots are always trained to fly even under a storm warning and there is nothing out of the ordinary about landing in bad weather. "We spend a lot of hours in simulators, practicing landing in low visibility conditions, in a strong crosswind," he said. "Perhaps the pilots overestimated the capabilities of their aircraft – the Boeing-737 training manual clearly states under what weather conditions the aircraft can operate – and also failed to assess the weather conditions in Rostov-on-Don. Therefore, pilot error is one of the main theories." Aviation experts emphasize that it is necessary to wait for data from the flight recorders before drawing final conclusions about the causes of the tragedy. According to Aviaport's executive director Panteleyev, investigators always examine the theory of a terrorist attack. However, in his opinion, this possibility is unlikely because the controllers did not receive reports about any incidents on board from the crew. Russian experts believe that this is also evidenced by the footage from surveillance cameras that shows the airliner exploding as it hits the ground.